Neither the DCAA nor any other federal agency endorses software products. 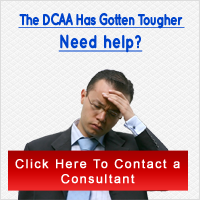 However, smaller companies can pass that nail-biting DCAA Accounting System Review. QuickBooks are able to get you through your first few contracts with the help of a third-party developer to adjust the QuickBooks into proper compliance. The process is not difficult. You need to contact those who can set the system up in such a way as to ensure that the system tracks direct and indirect costs by job, that it properly allocates labor costs as direct or indirect. The system will also have to adapt to specific timekeeping requirements, such as managerial approval of timesheets, timekeeping procedures, direct and indirect labor cost and labor tracking hours. Additionally, the system will have to segregate data as necessary by the DCAA standards and requirements, track interim, final contract costs, and create detailed reports prepared as designated by the DCAA. This may seem overwhelming, but there are many organizations that provide the necessary services you will need to adapt the QuickBooks software and to avoid major headaches later.